Just 238 days following election day in Nov. 2008, Minnesota finally has a second U.S. senator representing its interests. America’s storied auto behemoth, General Motors, stands on the edge of a financial cliff. Should it jump? Or should the government throw it yet another rope in an attempt to shore it up and save the giant from bankruptcy? Truth is GM can’t pull itself out of the tailspin it’s in. GM should file for bankruptcy and remake itself as a much smaller and focused car company if it hopes for a legacy to be part of the future. 1) GM must realize filing for bankruptcy won’t hurt the company’s already beleaguered image and brand. The cloud of bankruptcy won’t keep people from buying GM cars. Hell, no one is buying them now. 2) In an effort to save itself, GM is reducing research and development spend, which means little or no new, green-friendly hybrids (i.e., the kinds of cars people want to buy). Bankruptcy gives them a chance to refocus on marketable cars of the future. 3) GM can’t compete. Mercedes has a plan to transition its entire lineup of cars to alternative fuels by 2015. GM is cutting R&D by $1.5 billion by 2012, which allows them to stay operative for…one month. 4) The brain cluster at GM continues to lobby California lawmakers to prevent a law requiring car makers to reach an average fuel efficiency standard of 36 mpg. Kinda says it all, doesn’t it? Bankruptcy might help GM understand the landscape has changed since the 1960s. 5) Even with the government’s tens of billions in bail-out money, people at GM will lose their jobs. Bankruptcy will likely save more jobs than the bailout will provide. Why should we care? Isn’t it more wise to see billions of dollars diverted to things that have a chance of survival vs. burning that cash on the GM fire. I wonder if my vote will make a difference – effect change if you will? I wonder if the flu shot will keep me healthy through the cold and flu season? I’d much rather spend my day in front of the Interweb as pundits speculate on the outcome of the election. I’ve made my predictions to a few friends. We’ll know the answer to the vote thing on Wednesday morning…which is the first chance I’ll have to check in with a blog update. 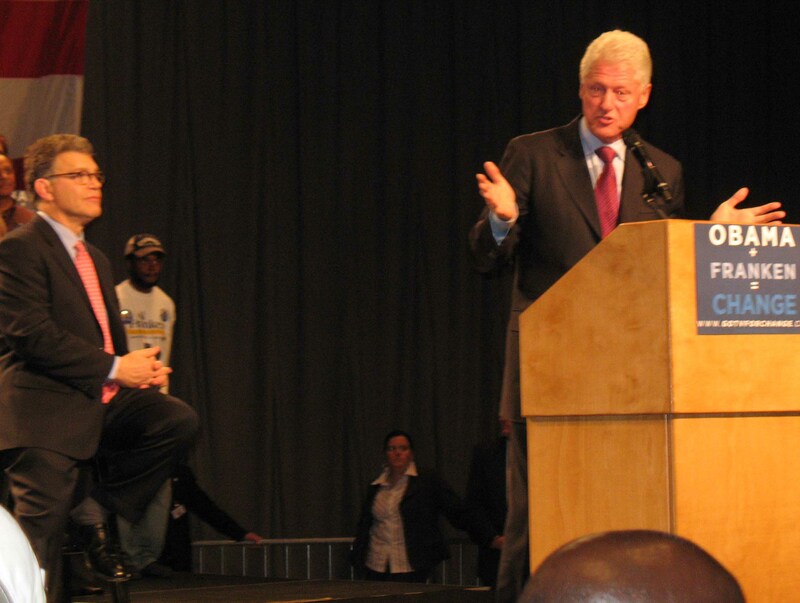 Thursday, Oct. 30, Bill Clinton jetted into Minneapolis. 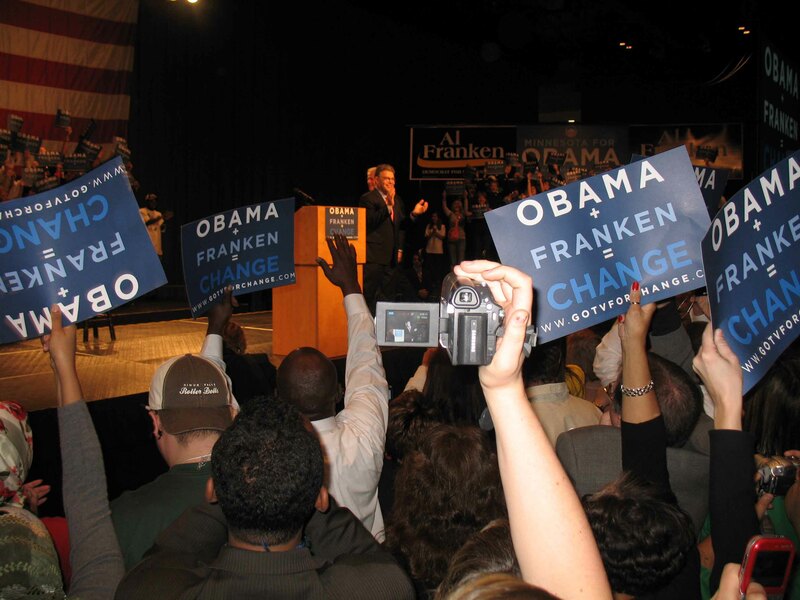 With Al Franken at his side, the former president spoke like the commander in chief he was – with august and resplendence. For a while, the clock rolled back to the ’90s when America was led by a president who cared about the middle class, who cared about creating jobs, who cared about doing the right thing for our country as a whole. Guess what? Clinton still cares and he’s still a great speaker. 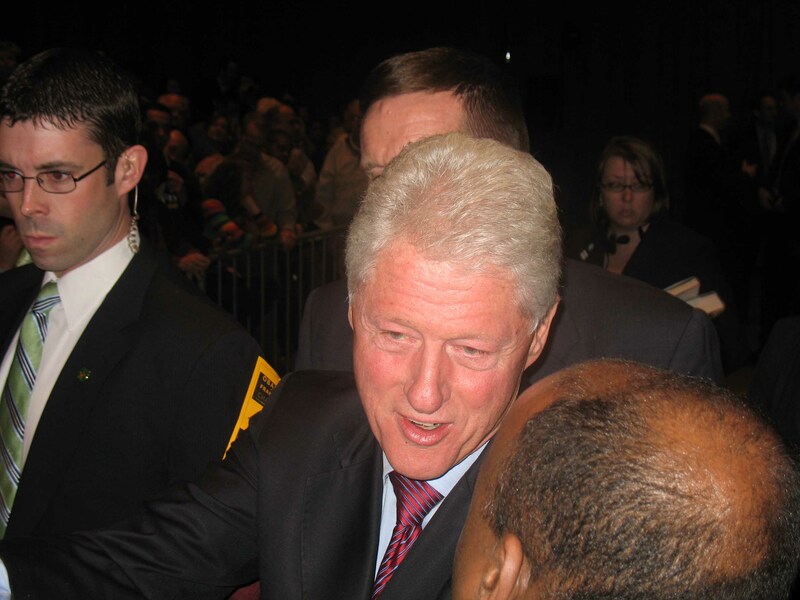 We shook his hand last night – not just a touch of hands, but I firmly shook the former president’s hand. Standing there on the rope line with the flag looking over the 4,000 people who packed into the convention center, I paused and thought, even with the blanket of turmoil we’re under today, we’re still a great country and we can get our swagger back. Vote on Nov. 4, people. Vote. Vote. Vote. President Clinton and senate candidate Al Franken arrived together after an intermission. Everyone quickly forgot we’d been standing on concrete for three hours once they took the stage. Al Franken (seated) and the rest of us listened to Clinton speak for a solid 40 minutes. I would have stood another hour had he continued.